"The Barefoot Café is a delight. The food was delicious and fresh, and the service friendly, prompt and courteous. 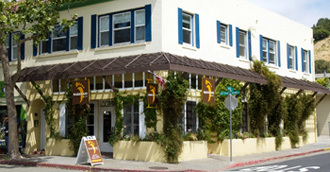 Fairfax offers many reasons to visit, and this charming little restaurant should be high on anyone's list." Welcome to Barefoot Café's interpretation of New American Cuisine: a unique fusion of freshly prepared local, organic & natural ingredients from Sustainable sources and innovative recipes served in a light, bright and friendly atmosphere. Whether you're looking for a "let's get this morning going" breakfast, an "All-Star" lunch or a "let's end this day on a highlight" dinner, The Barefoot Café will provide delicious food, a warm setting and exceptional service. The Barefoot Café's interpretation of "New American Cuisine" involves a unique culinary fusion of California's penchant for in-season produce & sauces coupled with innovative twists on Old World standbys. So everything is prepared from the finest fresh ingredients. Organic produce from local farms. Beef raised naturally on U.S. sustainable farms & ranches. Sauces, salad dressings & desserts prepared fresh daily in the Barefoot Café kitchen. Exquisite wines from small Napa and Sonoma vintners. The result? An imaginative, upscale contemporary version of Old World dishes made from luxurious American ingredients. Tony Senehi is more than a hired hand. He's part of the Barefoot Café family. That means not a single entrée leaves the kitchen before it passes his critical scrutiny. And after the evening rush slows down, Tony may drop by your table to see if every detail met with your approval. You'll find Tony a warm, affable person ... but when it comes to the quality of his food, he's an unrepentant tyrant! Friendly. Warm. Inviting. The Barefoot Café offers a light, bright, spacious interior that seems to invite you to relax and unwind. The staff is friendly, courteous to a fault and anxious to please. And very professional — the food always arrives hot and with a smile. Our objective is to exceed your expectations ... and we will!